The DONNA Foundation is excited to announce the Official DONNA App – A Complete Tool for Race Training and Healthy Eating. An App for everyone, the DONNA App will be our exclusive platform for DONNA announcements, training plans and connecting with supporters of the Foundation. Do you support our mission to Finish Breast Cancer? 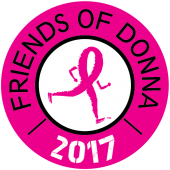 Show your commitment to the cause by listing your business in the Friends of DONNA Directory! Users of the app will be encouraged to support those businesses that support the cause. Already a Sponsor of DONNA Marathon Weekend? Contact us for details on this opportunity. Act fast to take advantage of our introductory pricing! Commitments are due on or before the 15th of each month to be featured in the Directory the following month. To learn more, contact us at sponsor@breastcancermarathon.com.